Important documents, but we must not be confused! A Breed puppy must have a Pedigree. 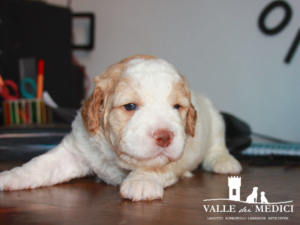 Lagotto puppies without pedigree are still sold today at a lower price. There are absurd logics of breeding to create such distinctions, certainly not the cost of the pedigree. Giving a pedigree to a breed puppy is ethical and mandatory by law. The pedigree is not a health certificate. There are thousands of diseases that can affect a dog, and those who welcome a dog in the family should be aware of it. Using healthy and controlled dogs for hereditary pathologies of the breed and for dysplasias it is simply a starting point and in our opinion an obligation to reproduce. Who sells a puppy with pedigree what gives us and what does not give us? Who gives a Lagotto puppy, son of parents who are checked for health, what does he add? The pedigree attests the genealogy of the puppy. It is not a simple attestation of belonging to the breed as sometimes one wants to make believe. Pedigrees are issued by ENCI/FCI and are recorded in the Geneological Book. The Pedigree is not so expensive to justify the difference in prices on puppies. Pedigree is absolutely not a health certificate for puppies! To certify the health status of a puppy, you need a veterinary visit to the puppy. Event that we always report in the vaccine booklet with the result, stamp and signature of the veterinarian before entrusting a puppy. The answer is all too simple! Test the reproducers and highlight the results. There are genetic diseases typical of each breed. Also serious pathologies have been fixed. For these reasons laboratories have worked to identify the genes responsible for the transmission of these diseases. With genetic examinations on breeding dogs can be excluded definily those diseases on puppies. The diseases of breed Lagotto Romagnolo are Juvenile Epilepsy, LSD neurodegenerative accumulation pathology and Furnishing. Do not test Studs and Bitchs from generation to generation is diabolical. Important information on the couplings arrives from genetic tests and X-ray official. Radiographs for official dysplasias. Why? Submitting reproducers to radiographic control has costs and takes time to manage the puppy. The official control is carried out after one year of age. The outcome is unfortunately not obvious. This is what scares those who breed and does not even subject their Lagotti to this control. If the outcome is not positive, the dog must not be allowed to reproduction. For the selection and improvement of the breed, subjecting reproducers to radiographic control is crucial, decisive. Tests are done to decide he couplings and not to gives those who buy a puppy some certificates . However, this certificates attest the quality of Lagotto Romagnolo puppy. genetic tests for breed diseases. examinations of dysplasias with official certificates FCI. This are different documents necessary to give a complete picture of how we got to that puppy.